PopCap Games, creators of such massively popular games as Peggle and Bejeweled, have just launched Plants vs Zombies Adventures, a free Facebook title that will ruin your workday. When PopCap released the original Plants vs Zombies in 2009, the game was an immediate smash hit. Its combination of an exceedingly simple learning curve and wildly addictive gameplay (plus its eventual availability on nearly every platform in existence) ensured its success, and in an effort to build upon that PopCap has just launched a game that only makes the formula more addictive. Here's the basic idea: You take the core gameplay of Plants vs Zombies (that is, pitting weaponized plants against hordes of encroaching undead), then add relatively simple world building aspects. 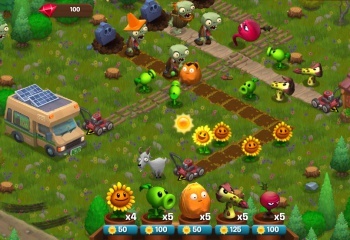 This being a free-to-play Facebook game, none of this can be all too complicated, but that actually aids the success of Plants vs Zombies Adventures as one could describe it as a cross between Plants vs Zombies and Farmville. As you'd expect, the combination of these disparate play styles is wildly addictive, particularly for those of you stuck in mindless, soul-crushing offices all day with nothing to keep you entertained save the internet. "But I already knew about this game!" some of you may now be shouting. Granted, Plants vs Zombies Adventures hasn't been a guarded secret, but today marks the first day of its availability to the public. Simply visit the game's Facebook page, hit the "play" button, and you've got a new digital vice. Keep in mind that the game is currently in beta, so it should be expected that the title will change over time, but other than that, there's no caveats. Plants vs Zombies Adventures operates on a relatively standard free-to-play business model, so if you're itching to play the thing, you can get to that right this very moment. Just don't tell Human Resources.